Your parents probably stressed the importance of brushing your teeth when you were little. You were told repeatedly that you would suffer from cavities and decay, if you didn’t brush often enough. As a pet owner, it is pertinent to understand that your dog is very similar to you. 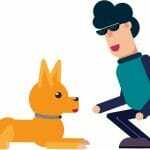 You should make sure that your dog follows the same hygienic routine as you. You need to take steps to ensure that your dog’s teeth remain clean and shiny. If you do not, your dog may suffer from a wide assortment of problems. It is common for dogs to have dental problems, but the best tartar remover for dogs can help! 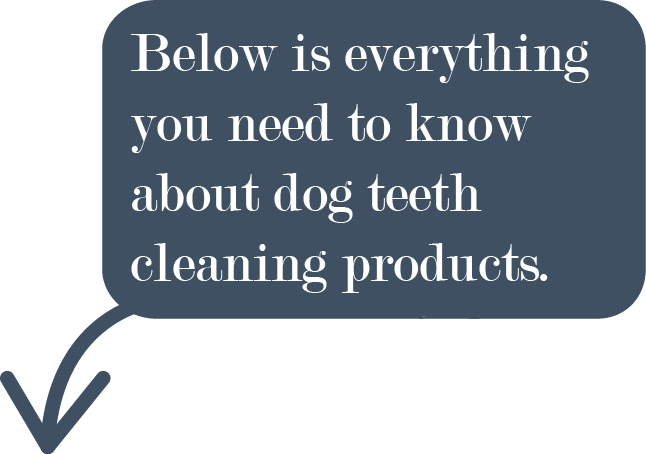 Below, you will learn more about the best dog teeth cleaning products. 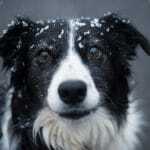 1.1 What Are The Most Common Dog Dental Health Problems? What Are The Most Common Dog Dental Health Problems? Believe it or not, dogs can suffer from many of the same dental problems as humans. If you do not brush your teeth properly, you’re going to be much more likely to suffer from these problems. Your dog is the same. What are the most common dog dental health problems? You’ll find out below. If you do not use a dog plaque remover frequently, there is a good chance that tartar is going to build up on the dog’s teeth. Tartar is made up of food particles, bacteria, calcium salts and other materials. In the early stages, tartar is referred to as plaque. Once it hardens, it will transform into tartar. Tartar needs to be removed from the dog’s teeth as quickly as possible. If you do not clean this material from your dog’s teeth, they’ll most likely develop gingivitis. There are numerous dog teeth cleaning products that can help remove plaque and tartar from the dog’s teeth. As mentioned above, gingivitis comes after tartar. In fact, it is caused by excess tartar accumulation along the gum line. This causes the gum to be pushed away from the teeth. This can create small gaps between the teeth and gums. This can also cause food and bacteria to get stuck in these crevices. Gingivitis usually causes the dog’s breath to smell terrible. It can also lead to swelling and infection of the gums. Give the dog’s gums a good inspection. Do you notice swelling and redness? Do the gums bleed easily? 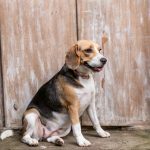 If you answered yes to these questions, there is a good chance that your dog is suffering from gingivitis. Dental wipes for dogs and other cleaning products can help prevent gingivitis. If your dog is suffering from gingivitis, you should take them to the vet immediately! If gingivitis is not treated immediately, it will eventually turn into periodontitis and that is far, far worse. Eventually, gingivitis will progress into periodontitis. This is a type of gum infection, which will target the structures of the tooth. It can negatively impact the fibers in the periodontal ligament, bone socket and the bone that supports the tooth. In return, this will cause the teeth to become loose from the gum. It can also lead directly to tooth decay. Periodontitis is incredibly serious. It can cause intense pain. It may even cause the dog to stop eating or drop their food from their mouth. You may also notice excessive drooling. Unfortunately, the results of periodontitis may be permanent. However, the best dog teeth cleaning products can help keep periodontitis at bay. Using the best dog dental water additive or another similar product can keep your dog’s teeth healthy. In return, this will prevent them from development periodontitis in the first place. 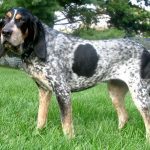 Once your dog has developed one of the aforementioned problems, their life is going to be negatively impacted. Dental problems in dogs can decrease the dog’s quality of life. It may make it nearly impossible for the dog to eat. Their eating habits may change and they may also experience a loss of appetite. There is also a chance that the dog will begin drooling excessively. Finally, dental problems can cause your dog to suffer from tremendous pain. Dental problems are incredibly serious and need to be avoided. If dental problems are not addressed, they could lead to far more serious complications in the future. If you have not been using one of the dog teeth cleaning products, you need to start doing so immediately! As a pet owner, you probably already know that dogs are extremely well known for their dental problems and bad breath. This is why it is imperative that you make sure you take the time to properly care for your dog’s teeth. Of course, the process won’t be the easiest, as many dogs hate getting their teeth brushed. With that being said, if you want to truly lighten your load and make the process easier, you should consider investing in Petrodex Enzymatic. Not only was this product specially formulated for pets, but also it helps fight plaque buildup, which can be an extremely common problem amongst many breeds of dogs. Many dogs don’t like getting their teeth brushed mainly because they don’t like the taste of the toothpaste. Fortunately, that won’t be a problem when you invest in the Petrodex Enzymatic. With its extremely potent poultry flavors your dog will literally eat this toothpaste up. Most dogs love licking their owners in the face, which usually isn’t a problem for most people. However, the only downside to this process is that dogs usually have extremely bad breath. However, you can completely change all that with the Petrodex Enzymatic Toothpaste. After using this toothpaste, you will literally look forward to your dog licking you in the face. While this product is already extremely cheap, you should know that you only have to use a pea-sized amount on a toothbrush to achieve the type of cleaning that you are looking for. When you invest in this product you will receive a 6.2-ounce tube, so you can rest assured that this product is going to last quite some time, depending on the number of pets that you have. You should also be aware of the fact that this product can be purchased in a single tube, or it can be purchased in a three pack. If you want your dog’s oral health to be in top condition, and provide him or her with great smelling breath, you have to consider investing in Petrodex Enzymatic Toothpaste. With its extremely potent poultry taste you won’t have a problem getting your dog to sit through an entire brushing. Does your dog have foul breath and yellow tarter on his teeth? If so, it may be time to consider switching out his existing toothbrush. Without the proper toothbrush, it is nearly impossible to keep your dog’s teeth clean and healthy. With the BOSHEL Dog Toothbrush, you will be able to remove plaque buildup and bacteria hidden between your dog’s teeth with ease. The BOSHEL Toothbrush is designed with the dog in mind. In fact, it can safely be utilized daily to combat bad breath and ensure oral health. The bristles are angled, so you can reach into your dog’s mouth and brush the teeth with ease. The ergonomic design will ensure you reach every inch of your dog’s teeth, including the front and back. If you are picky about your dog’s oral health, you have probably spent a lot of time researching and shopping for toothpaste. With this said, when you invest in the BOSHEL Toothbrush you do not need to worry about replacing your dog’s toothpaste. 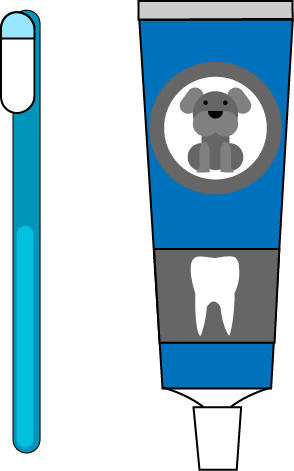 The toothbrush is designed specifically for all types of doggy toothpaste. Just spread a thick layer of your existing toothpaste on the bristles and watch your dog’s mouth transform into a healthy, clean and fresh oral cavity. If you have a finicky dog that does not like to have his teeth brushed, you will appreciate the included finger brush. This tiny brush will attach to your finger, so you can reach back into your dog’s mouth to brush his teeth. Some dogs feel more comfortable with their master’s finger in their mouth than a strange toothbrush. The bristles on the brush are designed to offer comfort, remove trapped food between teeth and plague along the gum line. Do you trust your vet to provide you with product recommendations? If so, you will trust the BOSHEL Toothbrush, as vets throughout the United States recommend it. When you invest in this product, you will be assured of getting a high-quality product that is totally safe for use with all breeds. The BOSHEL Toothbrush is backed by a 100 percent customer satisfaction guarantee. If at any time within 30 days of the initial purchase you decide you are not satisfied with the toothbrush, you will only need to return it to the manufacturer to receive a full refund. 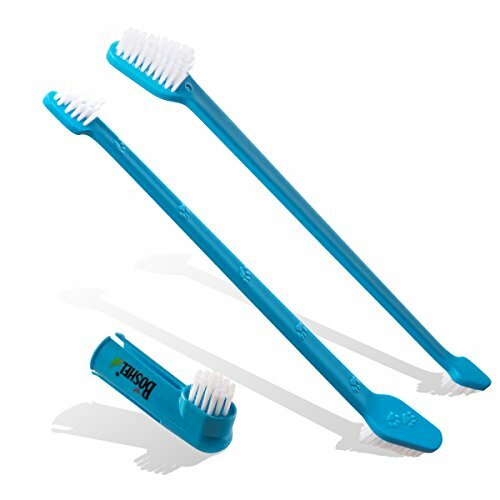 The BOSHEL Toothbrush Set is ideal for most breeds, including poodles, labs and bulldogs. The finger brush will work great for toy breeds, as long as you have tiny fingers. This toothbrush will tackle plague buildup, hard-to-reach trapped foods and bad breath, if utilized on a regular basis. Have you ever wondered why dog’s teeth are so strong and sharp? Well, it is because they really rely on them a lot more than humans do. Of course, humans rely on their teeth quite a bit as well, but dogs depend on their teeth for just about everything they do. They are often times biting and chewing on their skin to relieve itches, they chew their fingernails, and they need their teeth to chew through tough meats and dog food. This is why it is of the utmost importance that you take the time to provide your dog with the oral hygiene that he or she needs. With that being said, the process won’t be easy, because most dogs hate getting their teeth brushed. However, if you want to completely change that, you should consider investing in the John Paul Pet Dental Wipes. Not only will your pets love these tasty little wipes, but also it will completely change the way your care for your dog’s teeth. Trying to put toothpaste on a toothbrush and shove it in your dog’s mouth can be extremely difficult. They are always jerking their head away and by the time you manage to get the brush in their mouth, the toothpaste has probably already fallen off the brush. Well, fortunately, this won’t be something that you have to worry about when you invest in these dental wipes. You simply just pull a wipe out of the case and wipe your dog’s teeth. How would you like to freshen your dog’s breath, fight plaque build-up, and protect your dog’s gum all without the hassle of brushing? Now, you can with the John Paul Pet Dental Wipes. Have you ever tried brushing your dog’s teeth with a brush? If so, there is a good chance that you experienced great difficulty. If you’re sick of fighting with your dog every day, you should consider investing in the SyngeryLebs Dental Fresh. This product is manufactured in the United States and it works exceptionally well for keeping your dog’s teeth clean! How does it work and what makes it so great? The answers will be provided below for your convenience. One of the best things about the SynergyLabels Dental Fresh is the fact that it has been clinically proven. This product has been proven effective in delivering numerous benefits, including cleaning and whitening the teeth. It can also help freshen breath and protect the gums. On top of that, this water additive will actually combat gingivitis and periodontal disease. SynergyLabs Dental Fresh is ideal for all breeds. The formula is 100 percent safe and can be added to the dog’s water bowl. It may take several weeks to see results, but this is common with such products. The ingredients will work together to combat, stained teeth, bacteria buildup, bad breath and inflamed gums. Wouldn’t it be nice to be able to keep your dog’s teeth clean easily? With a toothbrush, you’ll likely find it difficult. Your dog will put up a struggle and they might even bite. The good news is that there are better solutions out there. The Virbac Dental Chews are a better solution for many dog owners. With dental chews, you’ll be able to give your dog a treat and their problem will be fixed before you know it. 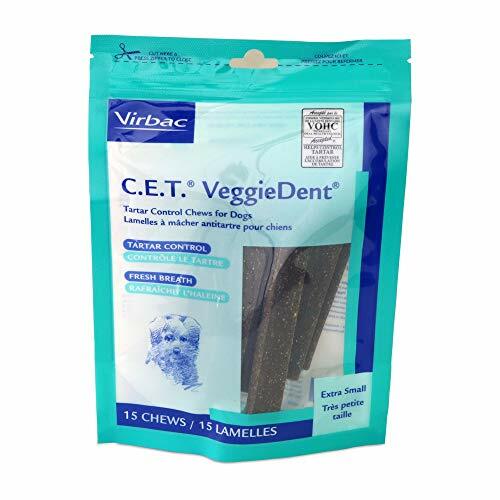 So, what is so great about the Virbac VeggieDent Dental Chews? You’ll find out below! Dogs come in many different shapes and sizes. This can make it difficult to find treats that are suitable for your pooch. The good news is that this is something you will not have to worry about with Virbac. This company understands that all dogs are different. This is why they’ve made their dental chews available in three unique sizes. You can choose from extra small, small and regular. You’ll have no problem finding a size that best suits your dog! A lot of people prefer brushing their dog’s teeth, because they want to eliminate the tartar and freshen their breath. The good news is that these dental chews are capable of solving both problems. As long as you give your dog one of these chews each and every day, their teeth will remain clean and their breath will remain fresh. In fact, these chews can achieve the same goals as a toothbrush and toothpaste. Tartar build-up is incredibly dangerous. It can lead to an abundance of serious problems. This is why all dog owners should consider investing in the Virbac Dental Chews. These chews have been given the VOHC Seal of Acceptance, because they’re capable of protecting from tartar build-up. With these chews, you’ll able to sleep soundly knowing your dog’s teeth will remain in good shape. It is vital to make sure you’re not harming your pet by giving them dangerous or unhealthy treats. This is not a problem with the Virbac Dental Chews. These chews are totally free of wheat gluten and animal protein. In fact, they have no animal-origin ingredients. The vegetable-based chews are delicious and safe for your pooch. On top of that, they’ll keep your dog’s teeth clean and their breath fresh! All in all, the Virbac C.E.T. VeggieDent Dental Chews are a great investment for most dog owners. They offer the most convenient way for dog owners to keep their dog’s teeth clean. Just remember that some dogs will not like the taste. Therefore, you’ll need to experiment a little. If your dog loves these chews, you should make sure that he or she gets at least once a day.